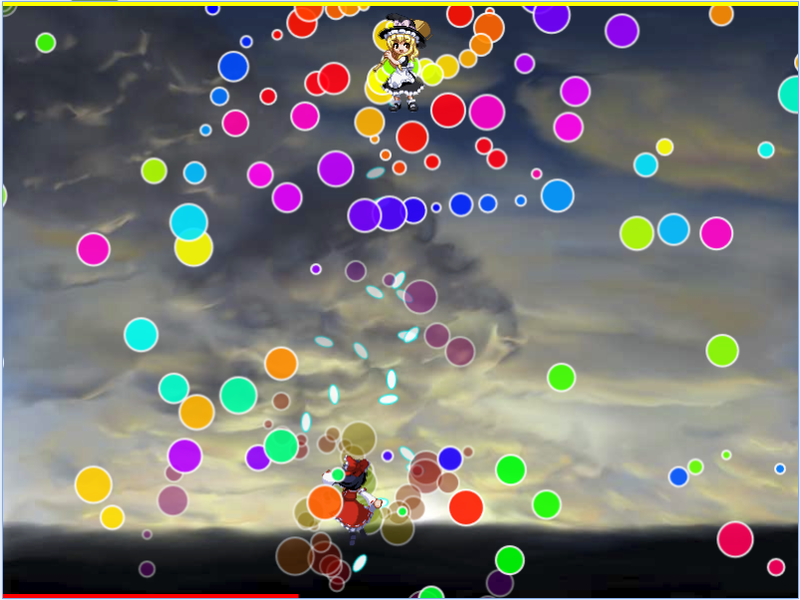 Bubble Hell Duel is a multiplayer HTML5 dogfighting game. The object of the game is to dodge bubbles launched from your opponent while returning fire. This game was written mainly as a prototype for learning and the source code is available on GitHub. You can try the game out in single or multiplayer here. Currently the game does not contain any sound effects but uses CreateJS and TogetherJS. In this post I would like to share some of my experiences when developing the game. Please share your thoughts in the comments if you agree or have other suggestions. When developing a 2d game you can write you own engine or make use of some fantastic libraries that are available. After spending a few days looking at the various options available I decided to use CreateJS. As I have some experience with Flash, CreateJS made sense for my needs as there was not much of a learning curve. I also wanted to make use of some Flash animations and CreateJS supported this feature. I will elaborate a bit more on animations later in the article. I’d like to mention a few other libraries that seem very interesting: Cocos2d-x is making an emscripten port and they already support HTML5 binding. I also like pixi.js as it provides a webGL renderer but also supports Canvas fallback when the browser does not support webGL. While this seemed a reasonable solution, it actually induced a bug that was very hard to find and I did not notice it until I tested the game after implementing some more features. I noticed while playing the game the opponent would never move. It took me hours in debugging before I could locate the cause. I do not think I would have made this mistake using C++. If you would like to see this bug in action take a look at this jsFiddle project. Look at the three canvas tag outputs and you will notice the third canvas contains the bug. This issue occurs because toFixed returns a string representation. I am not sure using a closure compiler would have avoided this issue, but I did find in another project that it definitely helps with optimizations. As with most games I wanted to use a good deal of animation. I was very familiar with creating animations in Flash and found that CreateJS supported several ways of consuming the Flash animations and presenting them in HTML5. CreateJS is a set of libraries and tools used to create interactive HTML5 content. So by using CreateJS I could consume my animations as well as use the other libraries available for loop handling, resource management and in the future, sound manipulation. For a quick introduction to CreateJS take a look at this video. CreateJS, which Mozilla now sponsors, offers great support for Flash animations. I should also note that you can use a tool called Zoë to export directly to a sprite sheet or a JSON file from a Flash Animation as well. The above image is an example of a sprite sheet that I use in the game and was generated as described above. 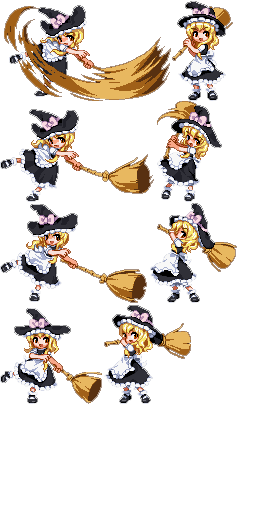 The original image came from the game Touhou Hisouten ~ Scarlet Weather Rhapsody, which is availabe at http://www.spriters-resource.com. On my first iteration of the code the game was not multiplayer. Originally it was a single-player bullet hell game, with a boss foe randomly moving across the screen. I could not last more than 30 seconds before succumbing to withering fire. It was interesting enough that I thought multiplayer would be exciting. I had heard of Together.js not long after it was released. The jsFiddle project is powered by Together.js and offers an impressive collaboration mode. This led me to using Together.js in my game. It is also very nice that Mozilla offers a default hub server simplifying the process of creating a multiplayer web based game. To learn more about Together.js be sure to check out this article. It was easy and comfortable integrating Together.js into my game, as it works like other event dispatcher/listeners frameworks. With Together.js, I was able to implement random match and invitation only multiplayer modes in the game. I did face a few design challenges that I had to overcome when designing the communication protocol. First off, I did not put code in to prevent cheating with two-party communications and assumed a certain level of trust between players. In the game design currently all collision detection of a player is done locally. Theoretically if you block corresponding messages you can mask that you have taken damage. Another area that I hacked a bit is that the bubbles of the enemy avatar are generated locally and randomly. This means that the bubbles seen from your character avatar are not necessarily the same as your opponent is seeing. In practice neither of these shortcuts should ruin the fun of the game. I did encounter a couple of issues or caveats with Together.JS. I did not find a way to disable the cursor updating in Together.js. While this is useful in collaborative tools I did not need it in my game. I am using Together.js in an asymmetric way, where both players see themselves as the red skirted Avatar (Reimu). This allows for easier placement of the player at the bottom of the screen and the opponent at the top. This also means that when you move the main player from an opponent’s view of the game your move is seen as the opponents move and vice versa. When a round finishes and the message ‘You Win’ or ‘You Lose’ appears, the time is frozen for a few seconds. This acts like a dramatic pause. When a charge attack is released, the bullets are fixed and then gradually blown away toward the enemy. Neither of these effects was designed in this way. I didn’t want the pause and I wanted the bullets to continue rotating around the player upon releasing. However I made mistakes, and the result seemed to be much better than I had planned, so they made the final cut. It is always fun learning new things. I like the fact that I could prototype and visualize pretty quickly. In the future I might add more patterns for the bullet curtains, and a few sound effects. In addition I will probably also draw more background images or possibly animate them. While developing the game I did realize in order to get a natural and intuitive feel required more effort than I expected. This is something I have always taken for granted while playing game. The code is open source, so feel free to fork and play. Be sure to comment if you have any suggestions for improving the game or the existing code. A happy hacker behind pdf2htmlEX and scanmem/GameConqueror. No I don’t work for Jetbrains, I just love their product phpStorm and are always impressed how much it assists me in (better) coding. Hi Simon, thanks for your recommendation! I happen to have a copy of IntelliJ IDEA, so I believe that webStorm should also be one of the best IDEs out there. It looks promising, and I’ll have a try! Most of the time I use vim for a comfortable editing, and then heavily rely on the compilers to check typos and other mistakes. It’s been working well for C/C++ or any other language with type checking. But this time for this project I was using brackets, just for a new taste. It does have a JSLint integration, but most of the time it just complained about formatting and spacing stuffs, so not actually much helpful. Please allow me to describe a common scenario where I found it difficult to debug JS. Say we are dealing with rectangles, there could be different ways of representing them. While designing the algorithms and the frameworks, I would keep myself busy with translating my thoughts into (pseudo)code, and I won’t pay much attention with the actual data types. Now here comes the most annoying part. In C/C++, the error can be detected at compiling stage, in Python, there will be an exception when I try to access rect2.x. But in JS, nothing happens until x2 is actually used in rendering the objects. And I found it difficult to find the cause of this kind of issues. Wondering how IDE could help debugging or preventing it. Sometimes I think that I might have been writing JS in a incorrect/inefficient way that is influenced by my C++ background, but not sure what’s the best way to prevent it. I wonder if you find this common in your development, and could you please share some of your approaches dealing with it? Does webStorm/phpStorm have good warnings? Unfortunately it doesn’t seem to like “let” statements, that most browsers support now. Yes it does mark globals, it also marks unused variables. haha, I guess a good IDE would deserve it. phpStorm/webStorm will certainly be of some help in your case. When typing rect1. it will autosuggest all your object properties, when typing rect2. though no properties will show up, but array methods. Of course rect.x will not be reported as an error, since it will just return undefined. You can also use jsdoc to annotate your objects and they will also show up in autosuggest. If your project is bigger you could also consider writing test cases. Annotation works to some extend, I’ve tried it with closure compiler. But if I have to write full annotation, probably I’d choose C++ + emscripten. Probably annotation is the only cure, I’m not so sure. Test cases indeed make sense, yet I also tried write assertions here and there, which helped a little bit. * @class Rect // or have a factory/module etc. Probably a possible way for lazy guys like me is to gradually add more annotations until I got the bug fixed. It seems more work if you do the jsdoc forehand, but you will also save in typing, because the IDE can autocomplete your code. Also I often don’t remember the function arguments and the IDE can tell you what they are and in the end you also make less mistakes that are hard to find later. Probably I’ll need also to try CoffeScript, TypeScript and other similar languages. The Game does create ghost-windows for me.